Humans have used the goat as a symbol for thousands of years and have given it a place in myth and legend; in recent times, images of goats are found everywhere from beer labels to heavy metal art. At the same time, the goat also remains a simple farm animal. From ancient myths to pop culture to profiles of domestic breeds, Extraordinary Goats explores the many facets of the goat. Goats are useful for their milk, their fur, and their meat, and they don't need a lot of acreage to be happy - in fact, they're known as the poor man's cow. But that's not why they're fascinating. Goats have personality. They can be friendly, angry, pensive, cranky, or curious; they can be your best friend or a thorn in your side. They can drive you crazy and make you laugh—or cry. Join longtime goat lover, farmer, author, teacher, and cheesemaker Janet Hurst on a light-hearted journey through the goat world, as she introduces the reader to these remarkable animals. Extraordinary Goats is chock full of historical illustrations and modern photos of goats doing what goats do riding motorcycles, climbing trees, chewing, singing, and being adorably irascible. 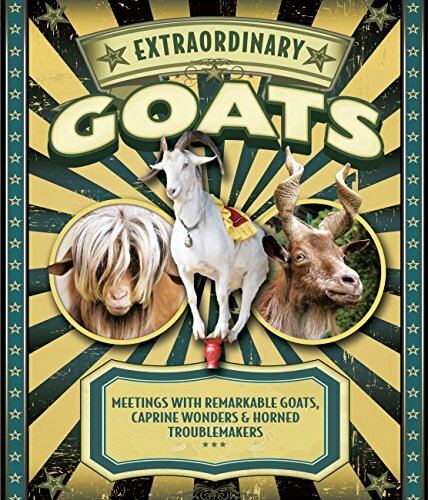 If you own a goat, or long to, you'll want Extraordinary Goats on your shelf. THERE'S NEVER BEEN A BOOK ABOUT GOATS LIKE THIS! Whether you own a goat, long wanted one or are just fascinated by videos of goats singing Taylor Swift songs and climbing towers, Extraordinary Goats is the book for you. Goats on the farm. ..in pop culture. ..sports. ..religion. ..and more! Extraordinary Goats explores the many facets of these caprine wonders. Goats are useful for their milk, their fur, and their meat, and many communities and airports employ goat herds for landscape management. But besides their productivity, goats have personality. Friendly, angry, pensive, cranky, or curious - goats can be all these things. Goats can be your best friend or a thorn in your side. They'll make you laugh and they'll drive you crazy. Its in that spirit, and their popularity that this book came about - especially when we realized goats are EVERYWHERE! There's Chapters on goats in music (check out the cover of The Beach Boys opus Pet Sounds: yes, that’s a goat. ), sports (there’s a reason the Cubs haven’t had much success the last 60+ years), beer, movies, and even religion explore the impact goats have had in so many areas. There’s also recipes, info on goat breeds, fibers and much more. Extraordinary Goats is chock full of historical illustrations and photos of goats doing what goats do: riding motorcycles, climbing trees, chewing, singing, and being adorably irascible.